Fattoria Poggio di Sotto was founded in 1989 on the south-east side of Montalcino, considered one of the best areas for the growing of Sangiovese. The property extends over some 32 hectares, 10 of which are planted with Sangiovese vines all registered in the Brunello di Montalcino appellation, 4 ha. with olive groves (1.400 trees) and the residual surface with forest. The vineyards gradually vary from 200 mt to 400 mt above sea level with steep slopes. The altitude, along with the protection of the ancient volcano Monte Amiata on one side and the Orcia river combined with sea breezes from the other, result in a unique microclimate allowing beneficial thermal excursions between day and night time even in very hot summers. In the steep vineyards, with an average ten percent slope the vines are cordon trained with a very low yield of about 3 to 3.5 tons per hectare due to a series of very strict cluster selections and thinning during the growing season. The estate is run according to the criteria of organic farming, guaranteed and certified by ICEA. 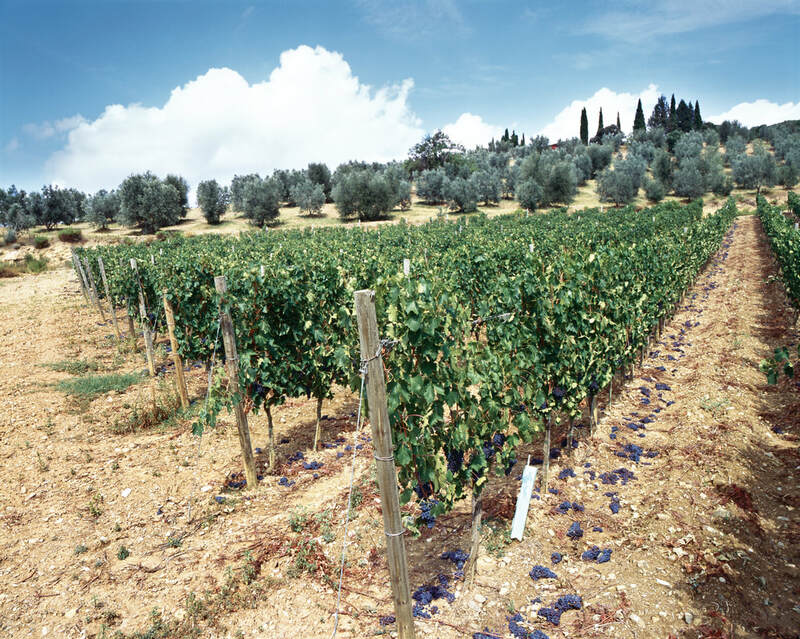 Poggio di Sotto’s vineyards account for about 10 hectares at varying elevations between 200, 300 and 400 mt a.s.l. The rocky soil is composed by gravel and clay in the lower parcels and sandy clay as one gets closer to the top at the higher level vineyards. The unique variety is Sangiovese, which in our case has a wide spectrum of sensory characteristics. The different age of the vineyards, the diversity in soil and altitudes creates various aromatic expressions of the Sangiovese vine. It is thanks to these elements that such a great complexity can be found in our wines. A very last selection is done during harvest and at the reception on a tapis roulant. The spontaneous fermentation takes place in 7 tons upright wooden and in stainless steel tanks, with prolonged maceration and pumping over. After malolactic fermentation, the wine ages in Slavonian oak casks, for two years for the Rosso di Montalcino, four years the Brunello di Montalcino and five years the Brunello di Montalcino Riserva. Bottle ageing will be a minimum of 6 months for the Rosso di Montalcino and one year for Brunello.